Can art revitalise a town? The Folkestone Triennial, now in it’s third edition, believes that it will. In tandem with the establishment of a creative quarter, the town has embraced art and design as way of attracting new visitors and activity to what was once an important port, much of whose former cargo now bypasses it through the Channel Tunnel and whose former visitors head south on cheap flights. This is a town compelled to re-invent itself. The Triennial attempts to integrate art into the very fabric of civic space. These 21 guest artists take a guerrilla approach by placing artworks under bridges, on rooflines, within disused sites and even under the sea. Lewis Biggs, the director, has named this year’s festival ‘Lookout’ taking a cue from the town’s maritime character. Some artists have embraced the theme, such as Pablo Bronstein’s ‘Beach Hut, in the style of Nicholas Hawksmoor, which resembles a miniature lighthouse placed beside other, more modest and traditional huts painted in jaunty, seaside colours. 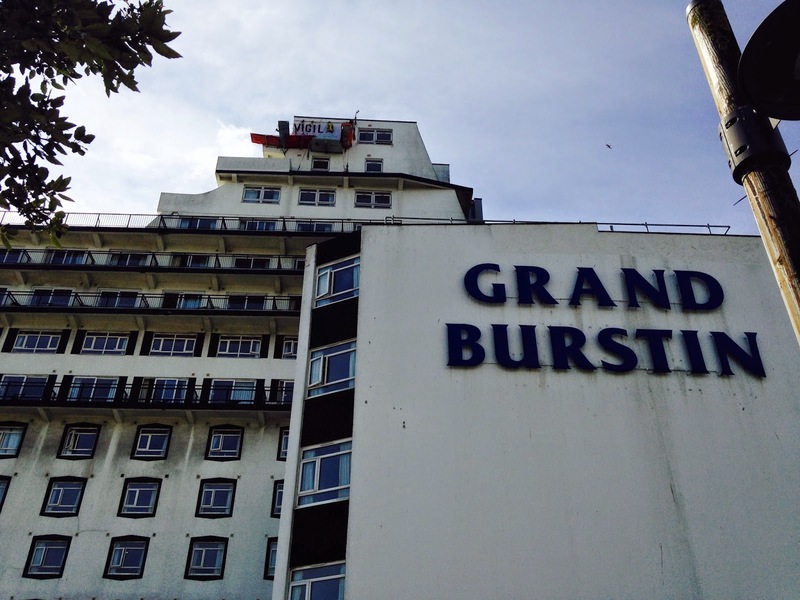 On press day, I saw Alex Hartley’s ramshackle eagle’s nest protruding from the roofline of a prominent hotel and Sixties eyesore, but missed the artist perching on the platform jutting out precariously over a car park, facing the sea. For the duration of the festival, he will periodically crawl out onto this makeshift ledge like an occupier or solitary mystic, combining architectural intervention with performance. Marjetica Potrc and Ooze, an architectural and design practice, have constructed a temporary lift that rises up adjacent to the town’s extraordinary Victorian railway viaduct, the highest in Britain. Originally conceived as wind-powered, the weather proved unreliable so the solution now is a digital screen indicating how much energy the turbine is feeding into the national grid and how much energy the lift extracts. Other artists have taken a less technical approach, addressing specific sites and associated histories of the town. 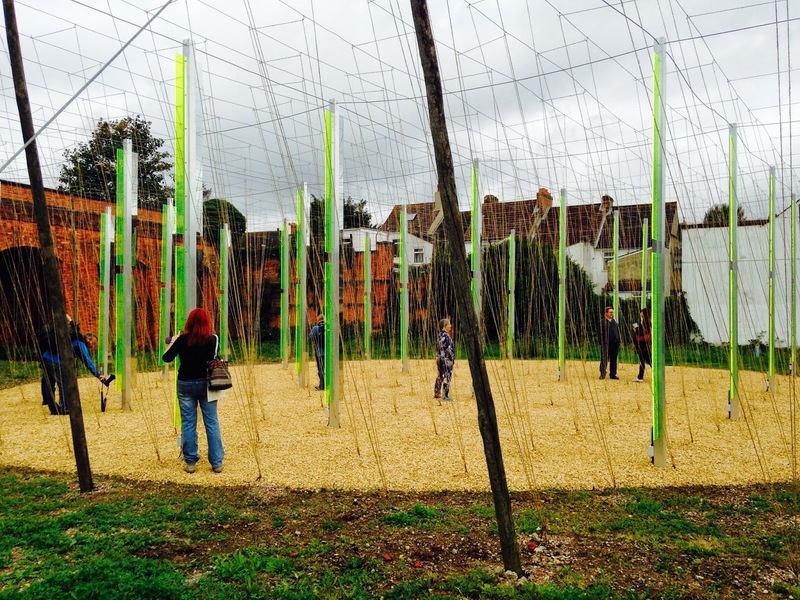 Jyll Bradley has built a temporary installation on the site of a former gasworks. Remembering days spent picking hops, a crop indigenous to Kent, she has constructed a matrix of string courses used to encourage the vines, supported by illuminated, upright struts. ‘Green/Light’ invites you to stroll through this memorial to agricultural craft thereby revitalising what had become sad and redundant. The highlight of my visit was a sound sculpture, ‘Undélaissé’ by Amina Menia, set up on a derelict site once inhabited by a food shop bombed during World War One. In an air raid, 60 queuing residents died. The pathos of that event is amplified by wandering across this neglected plot, now overgrown with thick clusters of buddleia that cuckoo plant colonising no-man’s land. Hidden speakers within the undergrowth repeat recipes for baking bread brought to the town by new migrants carrying memories of their roots. It’s a haunting work that links together death, loss and the simple but universal bonds of food, the stuff of life. 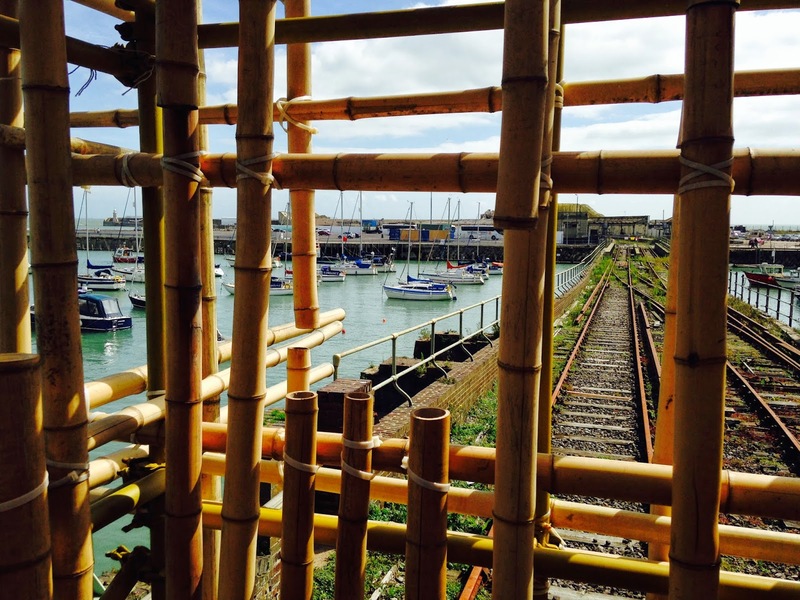 By the old harbour, Gabriel Lester has erected an impressive structure made of bamboo poles that sits above redundant railway lines, like much of Folkestone’s old infrastructure. Drawing on memories of living in China, the pavilion becomes a focus for considering the port’s historic relationship with the sea as trade increasingly reverts eastwards towards Asia. As I strolled along the harbour front, I met Sarah Staton standing outside her ‘sculptural pavilion’ a large freestanding steel sculpture punctured with Modernist incisions. A bench shelters under the steel shell ringed by edible plants. She’s hoping the hybrid shelter and bench can become a permanent feature of the seashore. 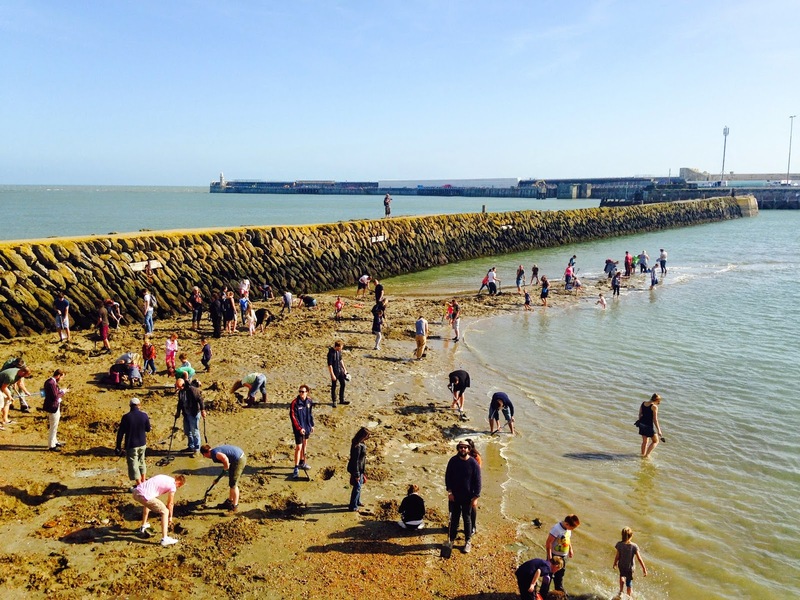 Folkestone Triennial is not a grand affair like the Venice Biennale or the Edinburgh Festival. It’s modest and humorous and vernacular without losing ambition. While instigating the restoration of a local park, it still hosts international artists such as Michael Sailstorfer whose ‘Folkestone Digs’ has been generating most interest. Thirty pieces of gold are buried beneath the sand of a harbour beach and ‘Folkestone Digs’ continues into the future until all have been found. I declined to roll up my trouser legs but enjoyed watching a large scrum of journalists, visitors and locals digging through wet sand in a hunt for gold hidden that morning under the cover of darkness. Despite some suspicions of an elaborate hoax, the diggers trustingly began the mucky task with gusto, instinctively hunting for treasure, like a pack hungry for food.